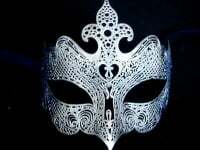 An extravagantly designed and handcrafted metal Venetian masquerade mask. 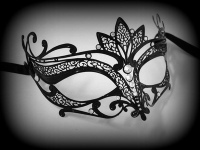 The definition of playful sophistication, this Elegance Filigree Venetian Masquerade Mask - Nero will take your breath away for its charming design. 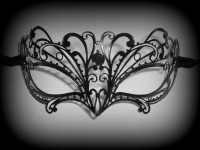 Wonderfully feminine, this gorgeous mask is designed in black painted laser cut filigree metal and features the distinctive flared scroll ends that's further enhanced by beautiful authentic Swarovski crystal for a touch of romance and for instant designer credentials. Add maximum glamour to your look with this must-have Elegance mask, perfect for the most luxurious Masked ball look.